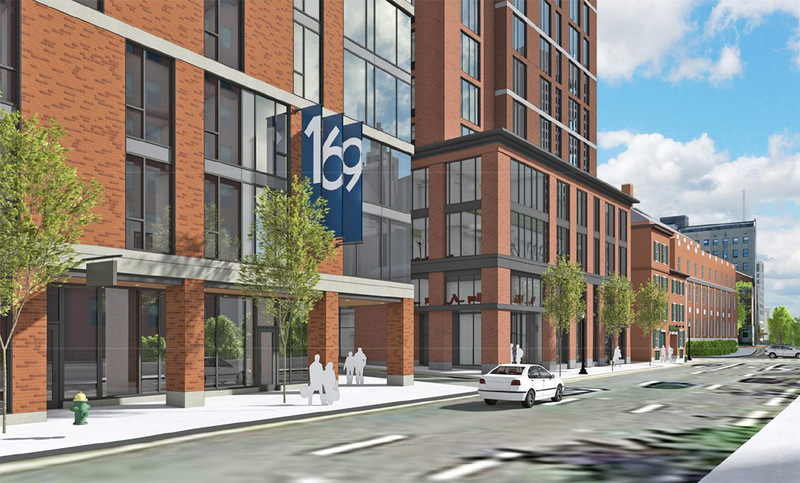 Rendering of proposed building at 131 Canal Street with the building under construction at 169 Canal Street rendered to the left of it. 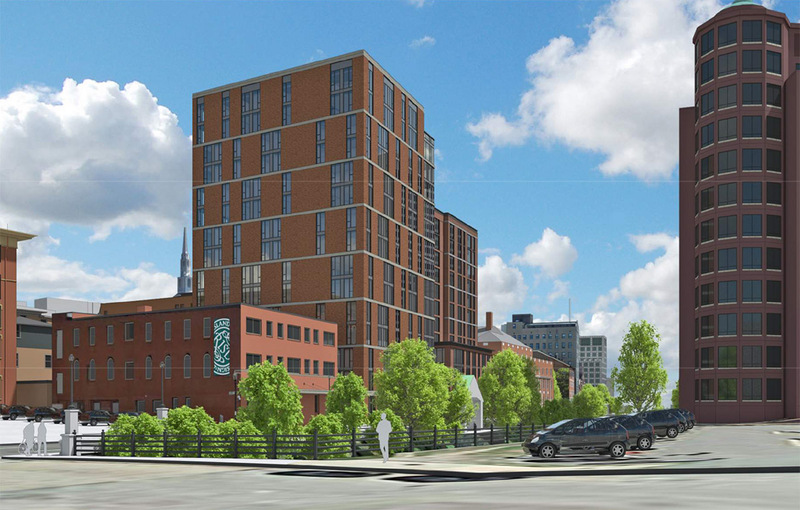 The 11-story mixed-use building at 131 Canal Street, Edge College Hill Two, is the only item on the agenda of this month’s Downtown Design Review Committee Meeting. 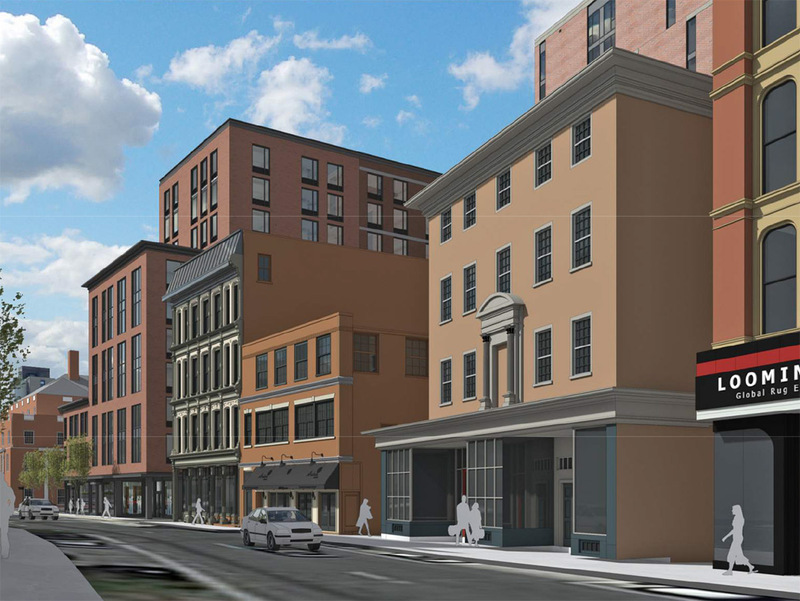 Scroll down to see the proposed renderings. 1. DRC Application No. 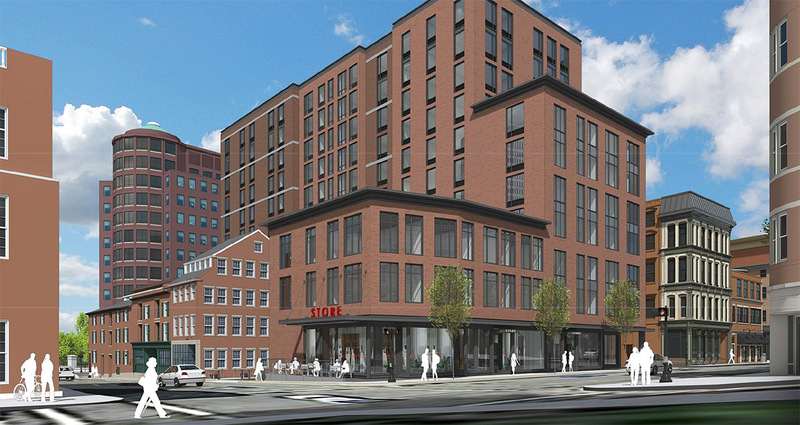 18.05: 131 Canal Street (parking lot) – Public Hearing and Conceptual Design Review – The subject of the hearing will be an application by Steeple Street RI, LLC requesting a development incentive in the form of a height bonus, and requesting waivers from Providence Zoning Ordinance Section 606, Design Standards for New Construction, for a new 11-story mixed-use building to be constructed at 131 Canal Street, Providence, RI. The height bonus requested is from Section 603.E.1, Schedule of Development Bonuses/Active Ground Floor Uses. 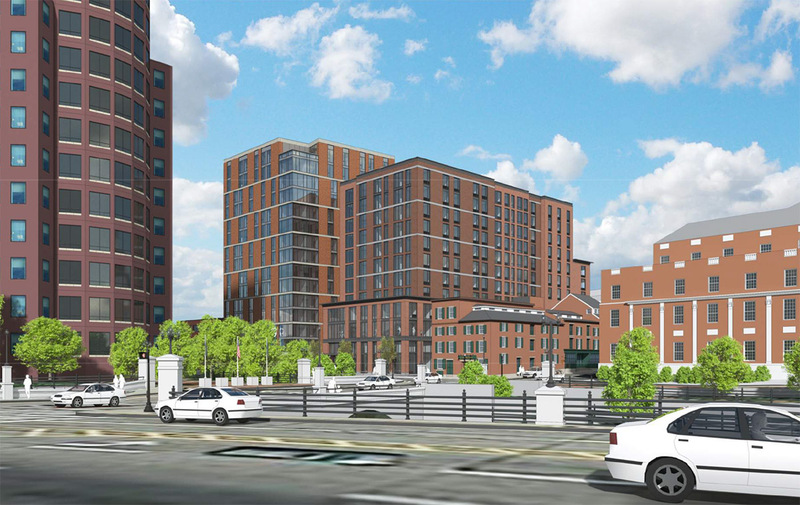 The waivers requested are from Sections 606.A.4, Building Height and Massing/Recess line, 606.D.1, Building Height and Massing/Façade Design, 606.E.1, Façade Design/Ground Floor Transparency, and 606.E.3, Building Facades/Upper Level Transparency. The DDRC will be reviewing the building design at the conceptual design stage. At the conclusion of the hearing, the DDRC will take action with respect to the requested items. Renderings by DBVW Architects provided by the developer. Short thoughts… I like it. 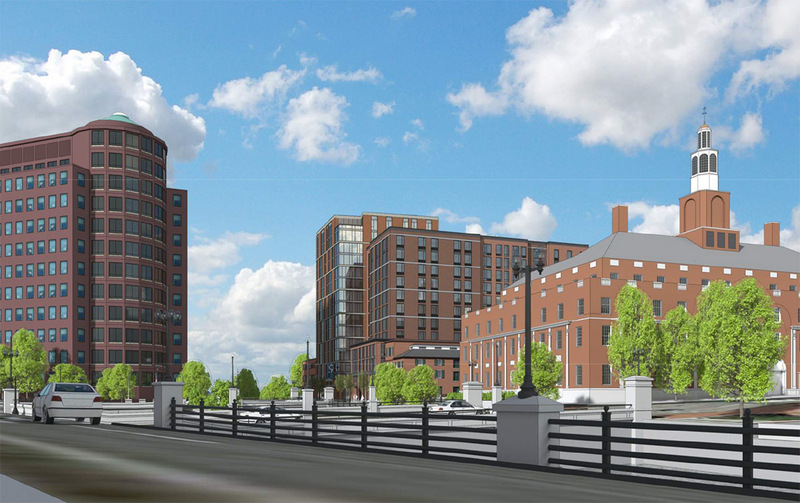 In some of the other threads on this project people have complained of the City being afraid of height; this proposal was scaled down from 15 to 11-floors. I actually think at 11-floors, this is better for the rhythm of the skyline in this area. 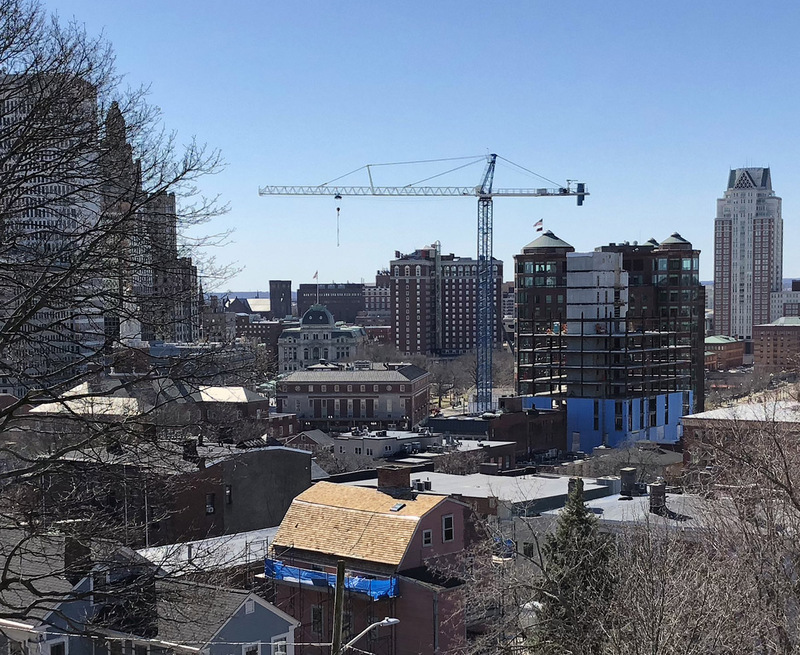 Across the river, the Citizens Building tops off 285 feet. 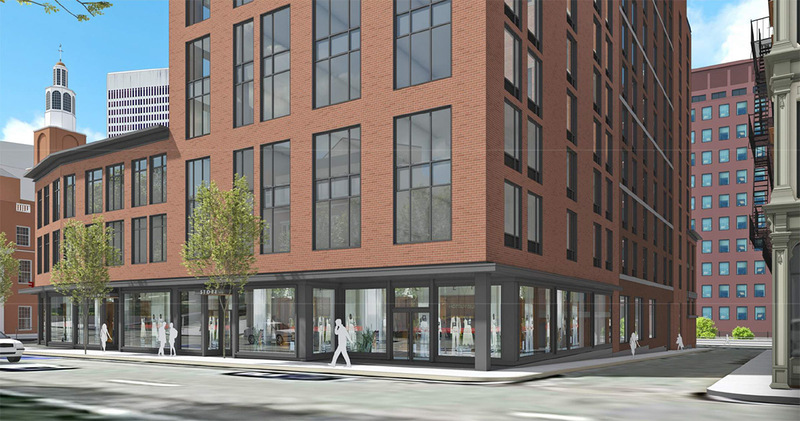 The neighboring building under construction at 169 Canal Street will top out around 160 feet. 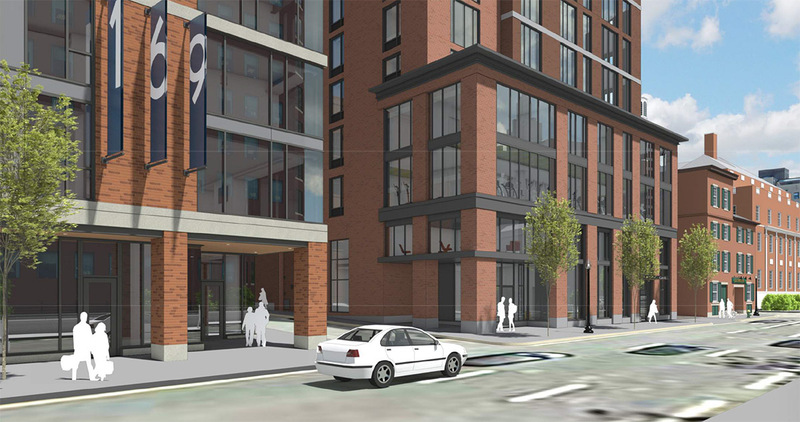 At 11-floors, this building will probably be somewhere in the neighborhood of 120 feet. That provides a nice rhythm to the height of the buildings. Having 169 and 131 Canal Street both top out at 15-floors would just look kind of weird and I don’t think higher than 15-floors is right for this site. Save that for Capital Center. I do wish the mass of the tower wasn’t brick. If you look down the river just a bit to the RISD Design Center, you see the precedence not only for height, but for the fact that historically, tall buildings aren’t always made of brick. 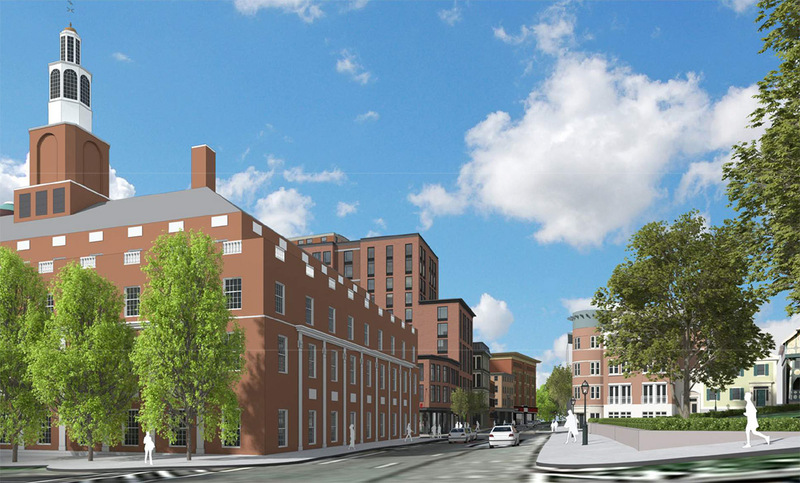 I’d love to see some sort of stone looking material on the mass of the structure, but the brick fetishism is strong in Providence. I’m willing to let it be brick because otherwise the building is quite handsome. Look above at the 7th image down, the view looking south on North Main Street. The new buildings really feel like they belong there, I like it. And of course I’m all about building on top of some surface parking lots. This meeting on the 12th is a public hearing, you’re encouraged to attend and give your thoughts on the project. 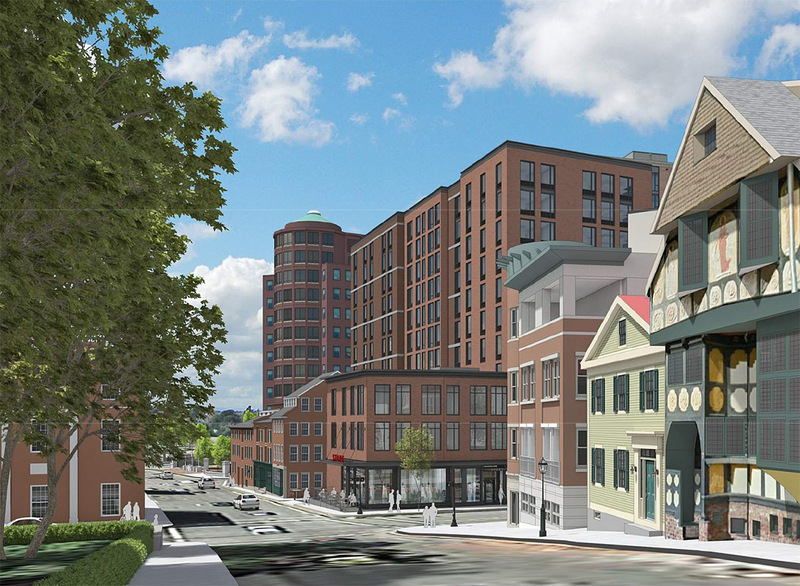 If you can’t make it or don’t like speak at public hearings, you can submit it written comments to Christopher Ise (cise@providenceri.gov) in the Planning Department. I’m not a knee-jerk anti-height person, but I do think it’s worth asking what this does to the view from Prospect Terrace. 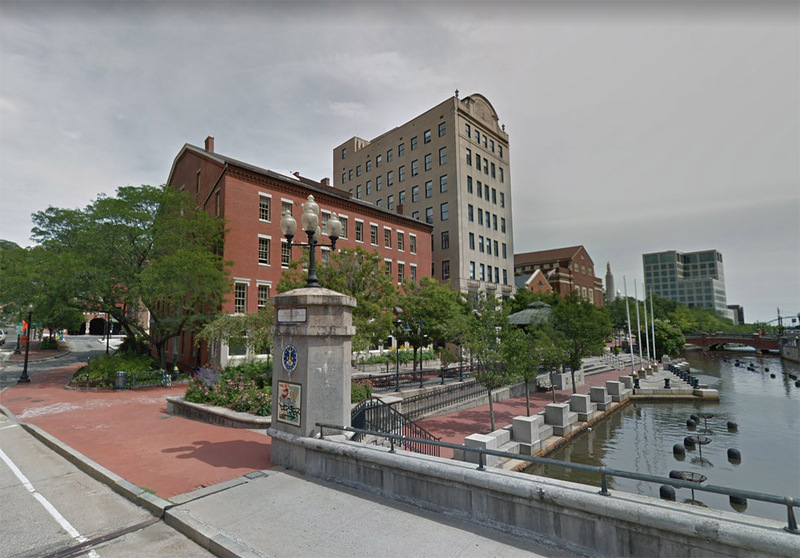 I would trade any two of the protected view corridors in the Jewelry District for the view from Prospect Terrace to Kennedy Plaza. This is the view from the left of Roger. You can see 169 Canal lines up with Citizens. 131 Canal will be to the left of that. You can right click to open this image bigger and zoom in a bit. I just did a rough massing model of a 120′ tall tower and dropped it onto the site of Edge Two in Google Earth. The top of the tower is about in line with the bottom of the dome of City Hall. Harder to say how far it projects width-wise, but the tower’s SE corner looks like it aligns with the NW corner of the federal building, effectively blocking the entire width of City Hall. My little test shouldn’t be taken as cold hard fact because it’s based on some assumptions, but I would like to see some updated renderings from the park that show both Edge One and Edge Two next to each other. Also, not to be a stickler, but compare your photo above to the rendering presented for Edge One. I know that there’s always a bit of guess work when matching a 3D model to a photo (been there, done that), but the height is at least twenty feet off. 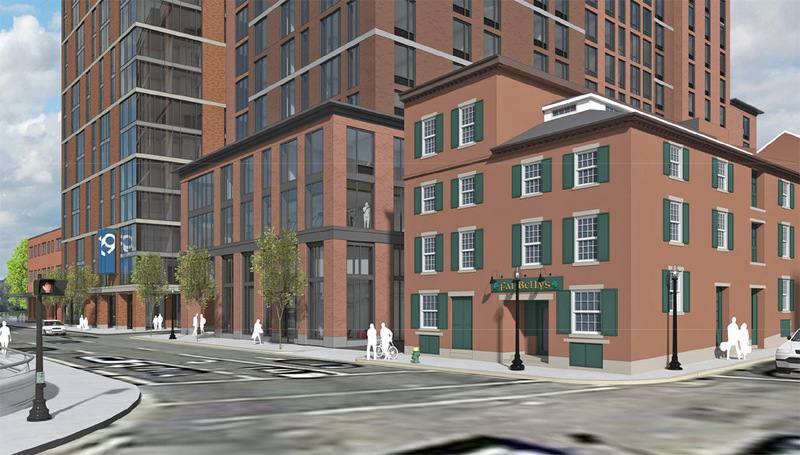 Will either of these buildings (they’re the same developer, right?) have shared roof deck space? Someone in one of the previous threads was complaining about a lack of balconies. The responses pointed to the expense and maintenance hassle as the reason why you wouldn’t put balconies on a building meant for the lower to middle end of the rental market, but he did have a point that a selling point for these buildings could be the potential for “viewing” city events like Waterfire, NYE, Fourth of July, etc. A roof deck would be smart. I agree it’s a good design. The overuse of brick these days is a little much, but it works for this block. It would have been a more sophisticated design, if the tower facade portion was in a lighter material or color (even if brick). i thought that recessed ground floor entrances/facades were a thing of the past. 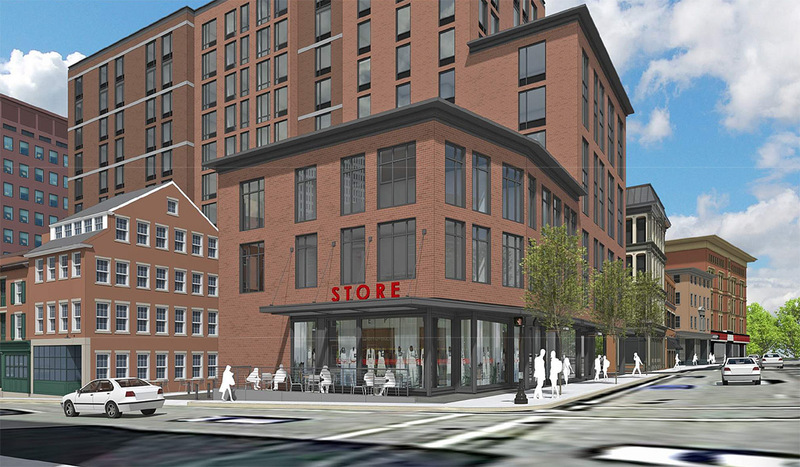 not a huge fan of how they present to main as a result — but otherwise this seems like a project that’s ready to go forward. Gahh. It’s got a PTAC in every window. That alone debases the quality of the design massively. Nothing like giving an otherwise fine building the HVAC system of a low budget motel. Anyway, I’ll be there to give a quick comment in support. Can’t let the parking lot lovers have the only say. Love everything no but the brick. Wish the two projects were a little bit more differentiated. Totally agree with everyone’s comments, but just one thought: it would be nice if the sidewalk space along Canal were a little more inviting. It looks like169 Canal has a small arcade along the sidewalk, and it would be nice if 131 Canal did the same. There is so much that could be done along this block to connect Canal Walk to RW Park, and to make it more pedestrian friendly as well. For example, you could reduce Canal from Park Row to Steeple Street from three lanes to two (effectively extending Canal Walk along the Moshassuck), and make the intersection of Canal and Steeple much more pedestrian friendly. All it would take would be a couple of concrete planters and a bucket of paint for starters, but If the city were to give the developers of Edge Two some sort of financial incentive to take this on, maybe they could include it in their plans and do something really nice. Could be a win-win! The City has proposed to reduce Canal Street to two lanes and install a bike lane along the side of the street where these projects and the park are. This would include a new traffic light at Canal and Park Row. I cannot remember the status of the funding. 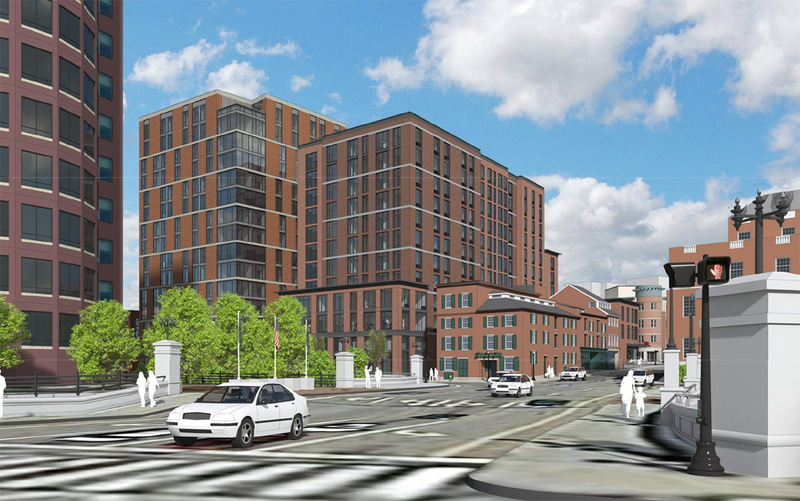 If this building ends up happening, the bike lane would probably not happen until after construction is finished there. Jef, that’s fantastic news! Would it be a two-way cycle track or just a bike lane?